Premium audio producer Bang & Olufsen has launched the Beosound Edge, a large speaker designed so that that users can roll it to change the volume and other controls, one that will also support Apple's AirPlay 2 when it ships in November. 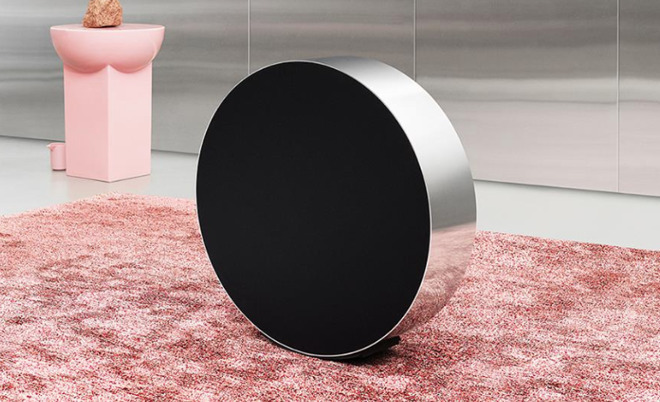 Measuring 50.2 centimeters (19.8 inches) in diameter and 13 centimeters (5.1 inches) thick, the circular Beosound Edge is designed to be a floor or wall-mounted speaker. While it does include a small "stand" at the bottom to stop it from rolling around the room while on the floor, the speaker is weighted to prevent it from falling onto its front and back, and to stay in place. Taking advantage of the shape and size, the speaker has been designed with rolling in mind, with a touch-sensitive interface at the top of the surrounding aluminum band lighting up with proximity sensors. While the interface can be used to manage playback and track changes, the speaker can be rolled from side to side to tune settings to the user's preferences, such as adjusting its volume. Inside the Beosound Edge are two 4-inch mid-range drivers, two 3/4-inch tweeters, and a slim 10-inch woofer. Six Class-D amplifiers drive all of the speakers, while an active bass port that can swap between closed box and ported modes, allowing bass to be accentuated at loud volumes but reduced at quieter levels. Bang & Olufsen has included support for AirPlay 2 in the speaker, allowing it to work with a user's other audio devices to create multi-room audio setups, along with support for Chromecast Audio and Bluetooth connectivity. Expected to ship in mid-November, the Beosound Edge will be priced at $3,500.